Samsung should really just make the Galaxy A8 (2016) official already. The handset has been leaking a lot lately, including in official-looking renders, and it’s even been certified by the FCC and the Bluetooth SIG. What’s more, it’s been spotted in both theGFXBench and the Geekbench databases with similar specs. And today the upcoming device has had a go at the AnTuTu benchmark too, something which once again reveals its hardware innards. According to AnTuTu, the Galaxy A8 (2016) sports a Full HD display, an 8 MP rear camera, a 5 MP selfie snapper, the Exynos 7420 chipset, 3GB of RAM, and 64GB of internal storage. It runs Android 6.0.1 Marshmallow. The main camera resolution has to be wrong, though, since this phone’s predecessor, the A8, has a 16 MP unit on the back. AnTuTu has however revealed that there will be a version of the A8 (2016) sold with 64GB of built-in storage. So far we’ve only known about a 32GB model. Both will have a microSD slot for expansion as you’d expect. 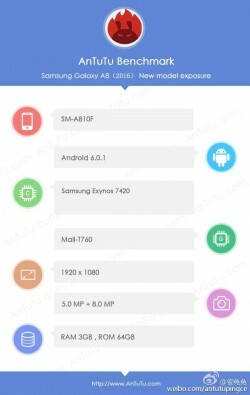 As for the screen size, it should be 5.7″ – identical to that of the original Galaxy A8 from last year.